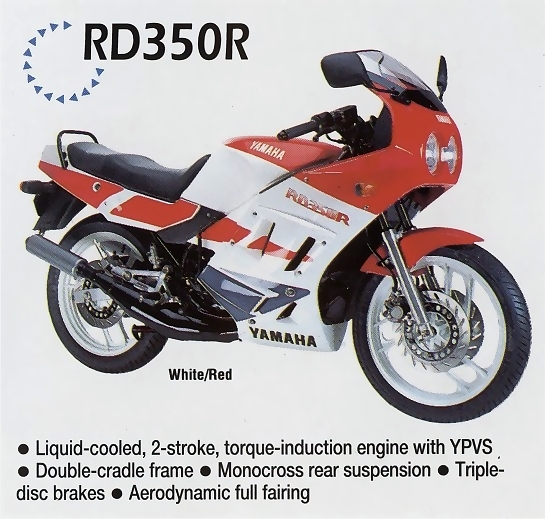 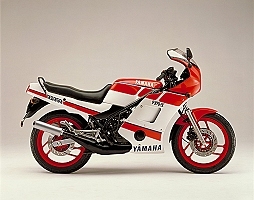 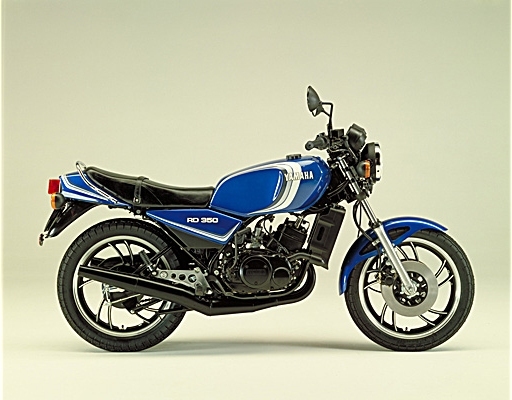 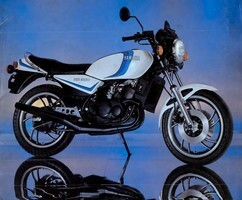 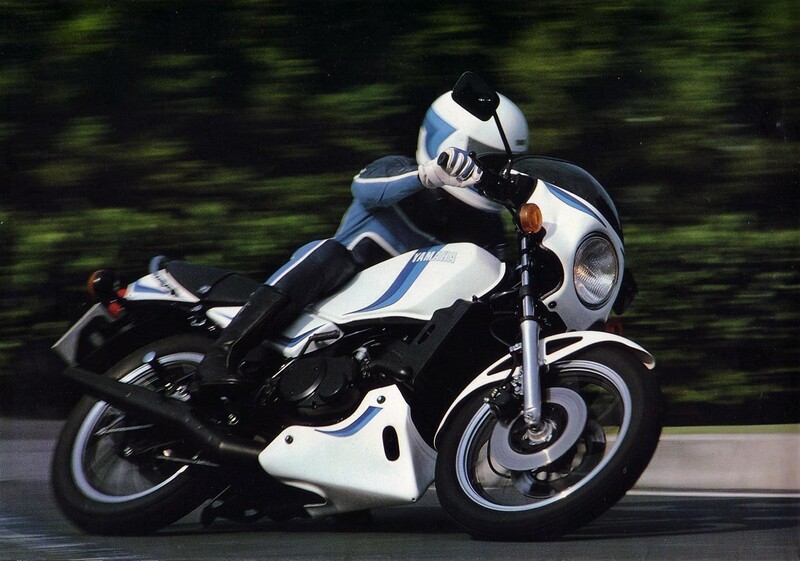 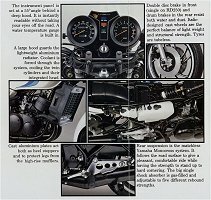 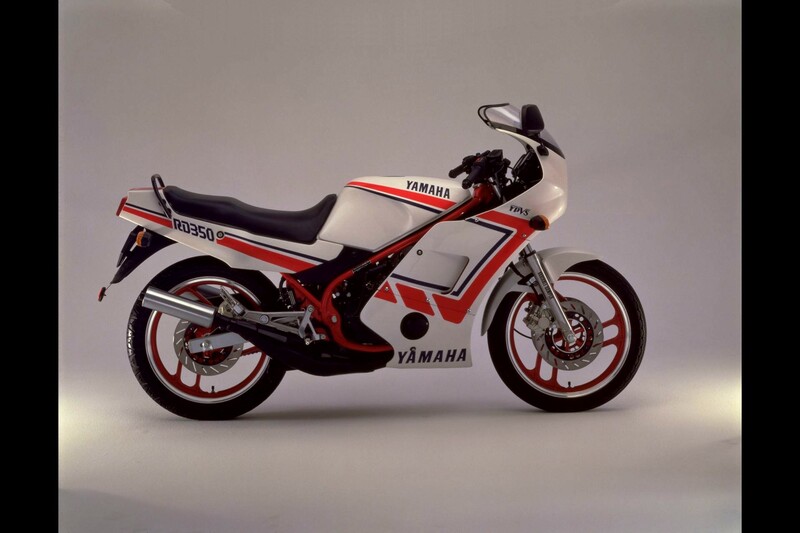 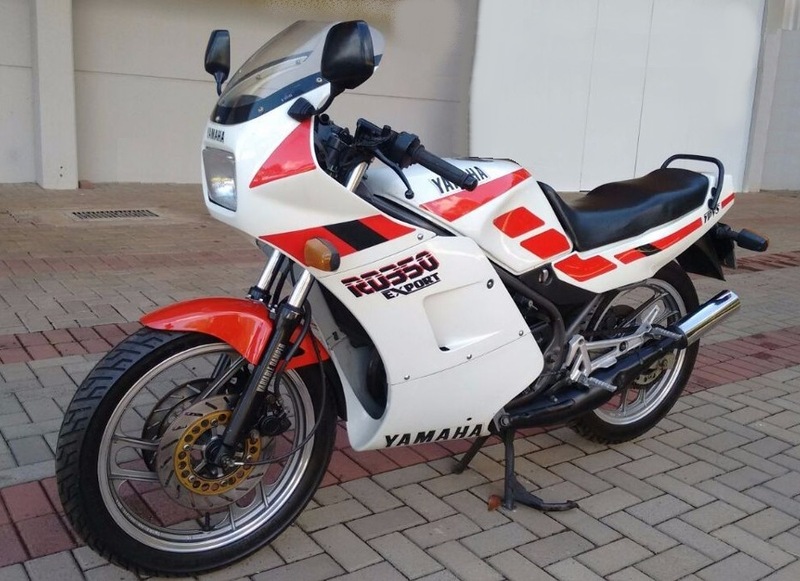 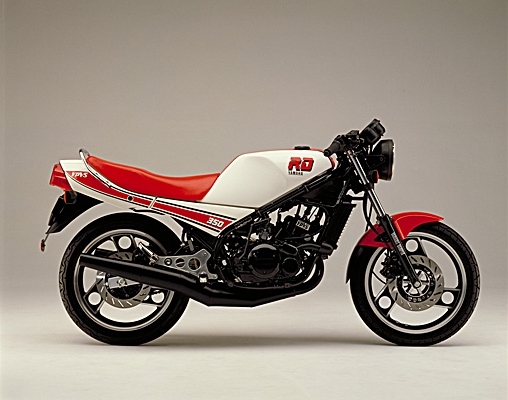 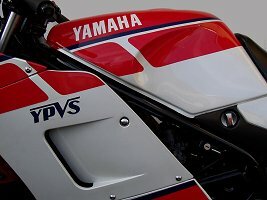 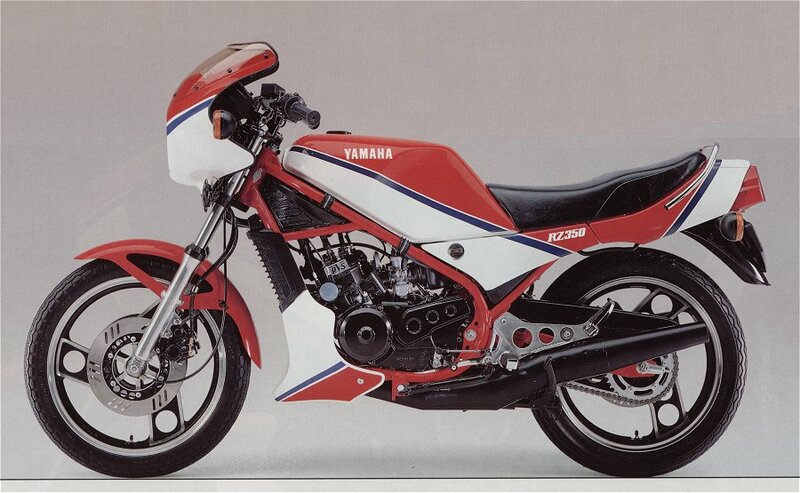 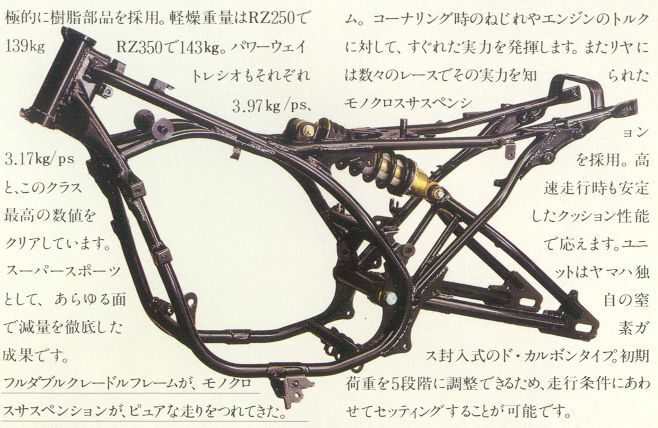 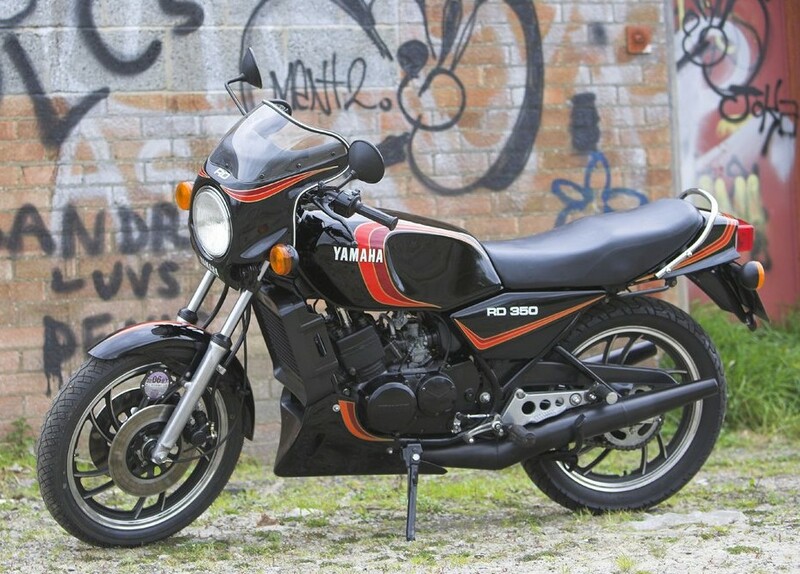 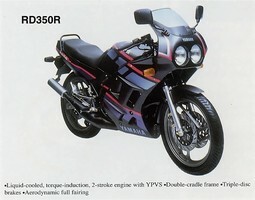 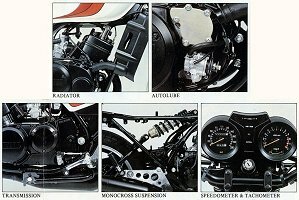 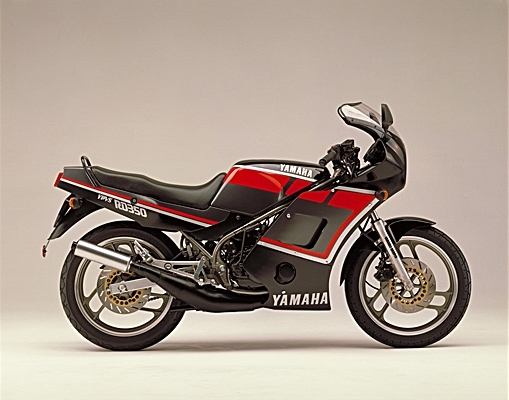 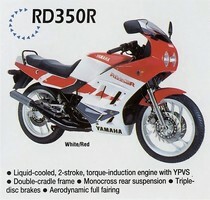 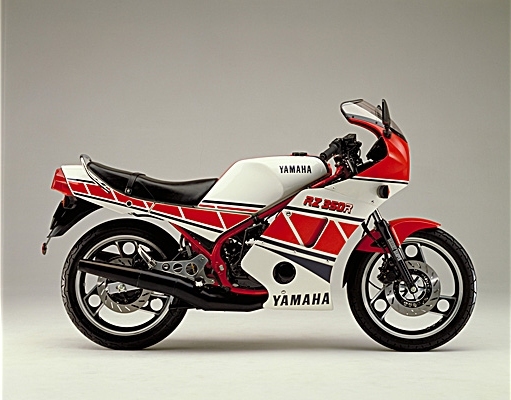 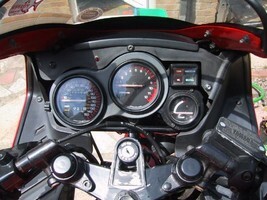 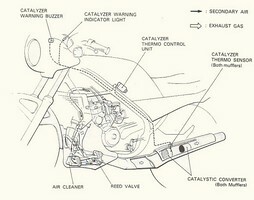 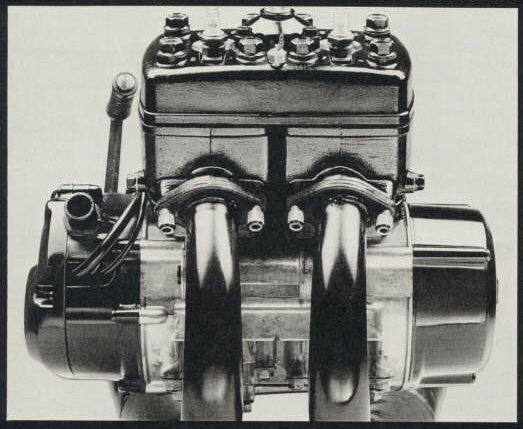 HISTORY OF THE RD & RZ 350 LC. 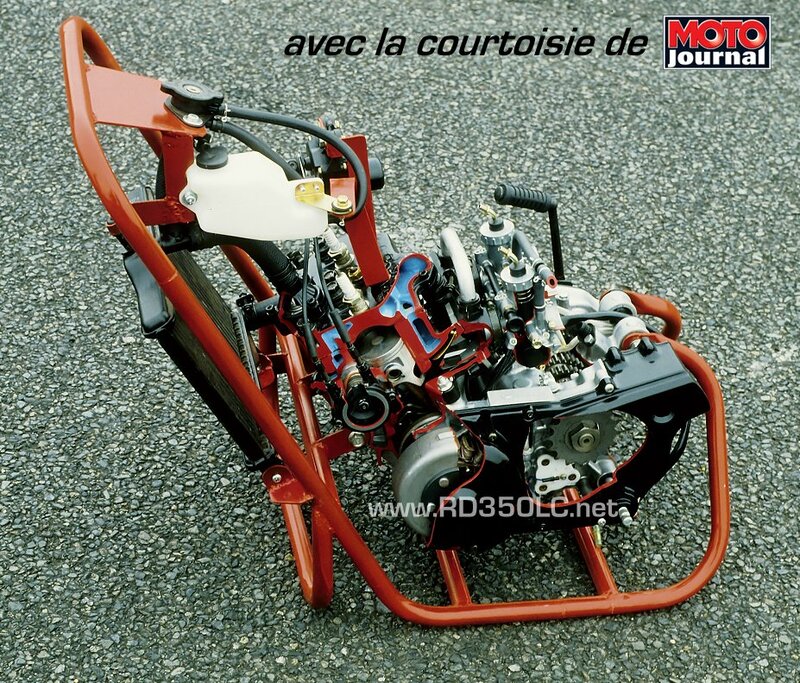 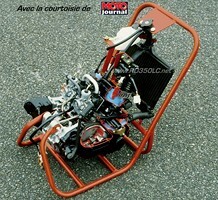 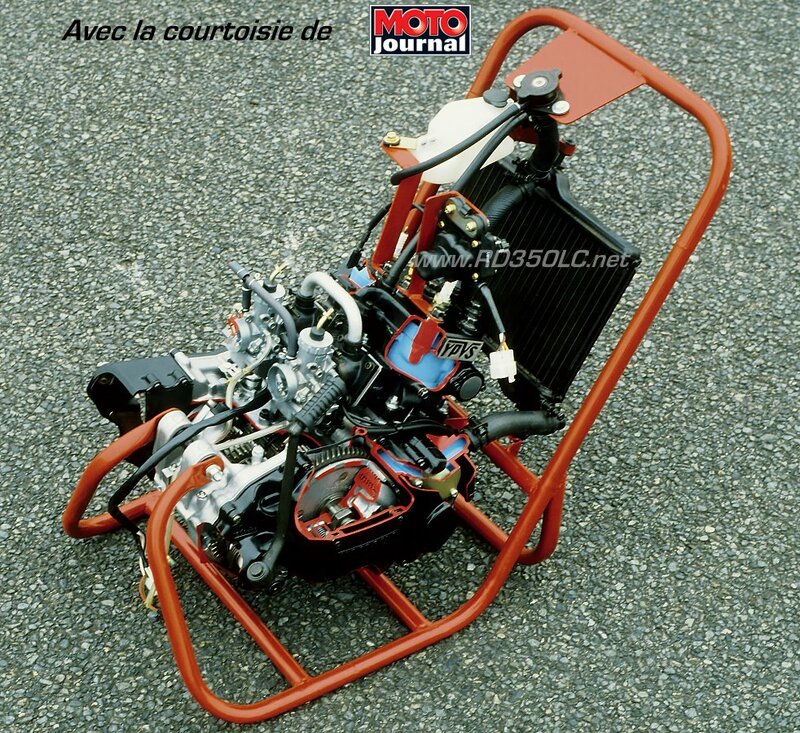 September 1979: First pics of RD350LC in French press with wheels of RD400 and only 1 front brake disk. 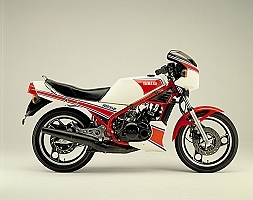 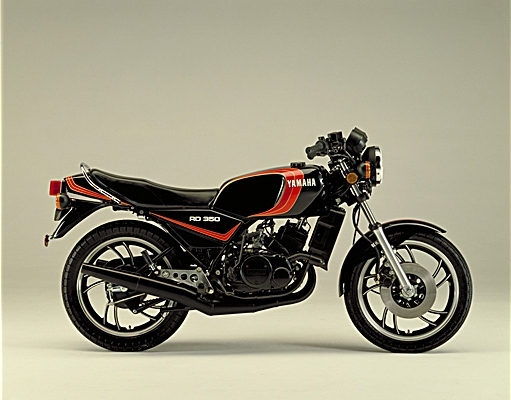 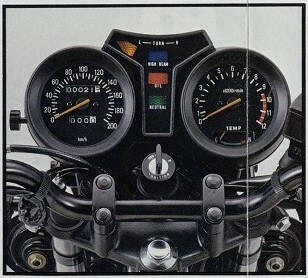 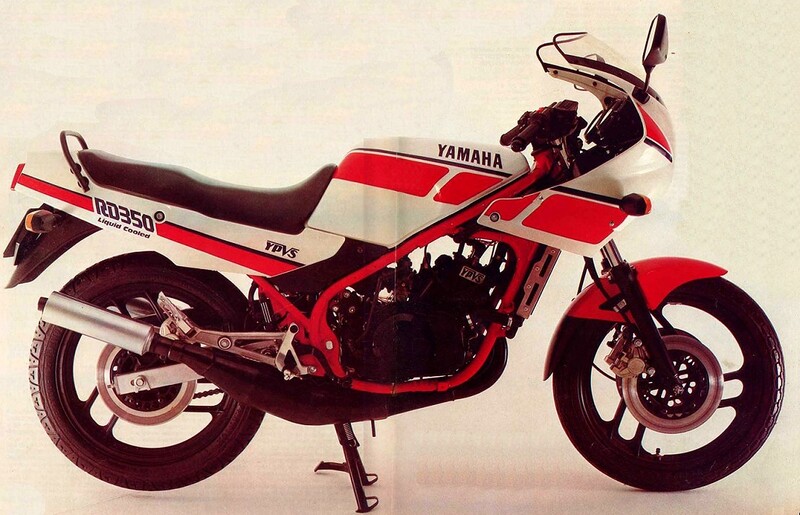 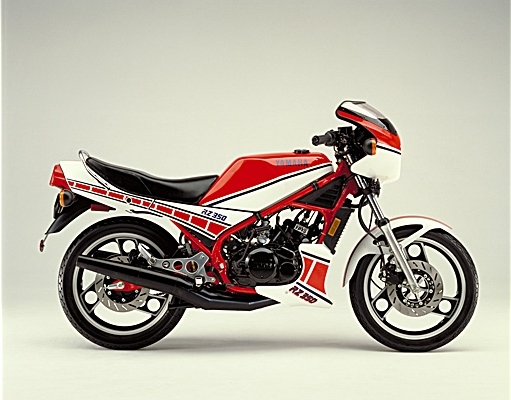 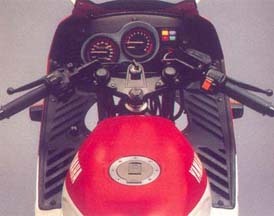 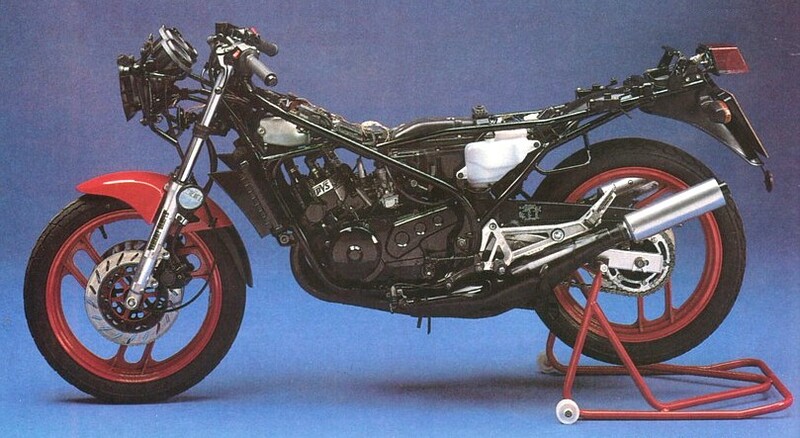 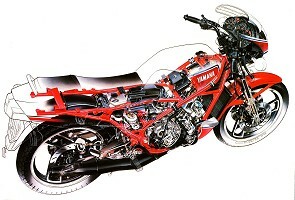 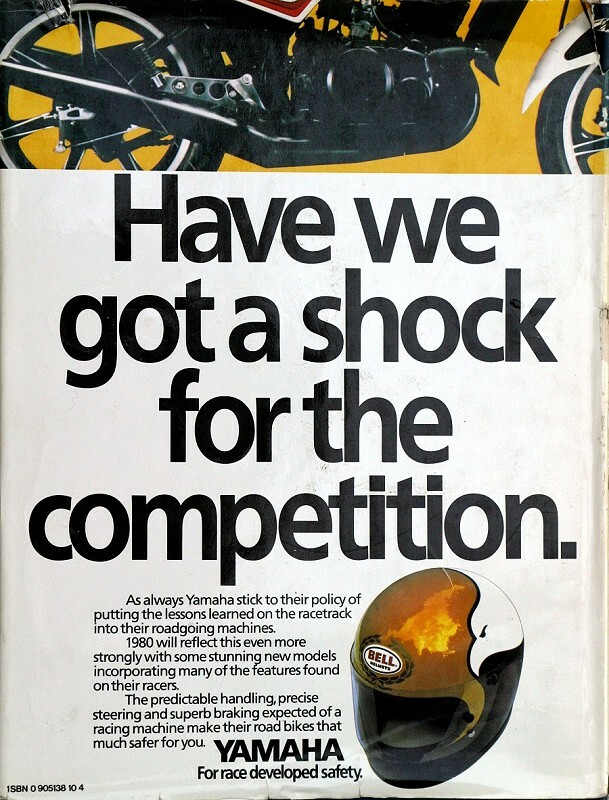 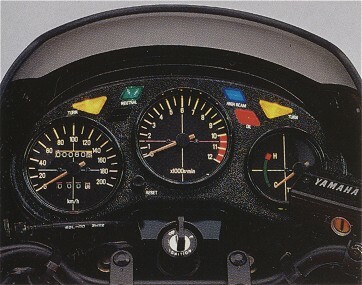 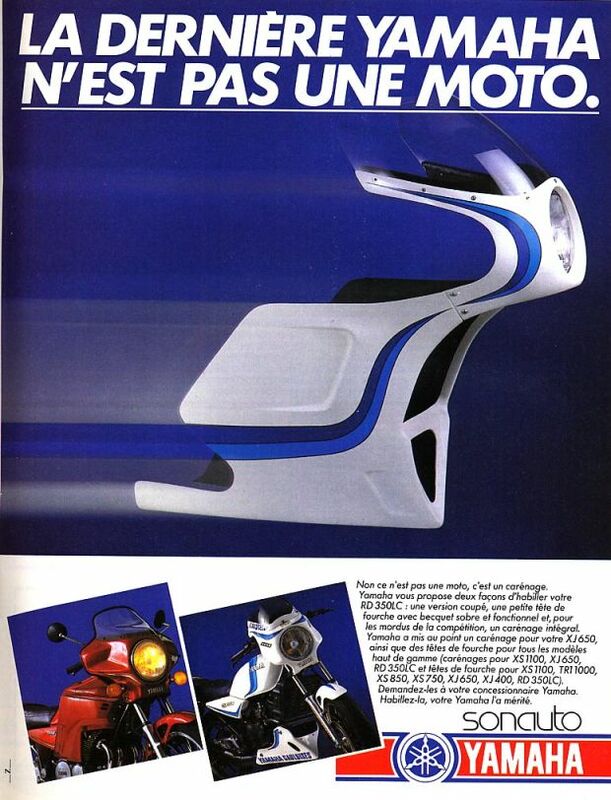 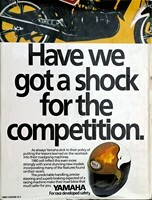 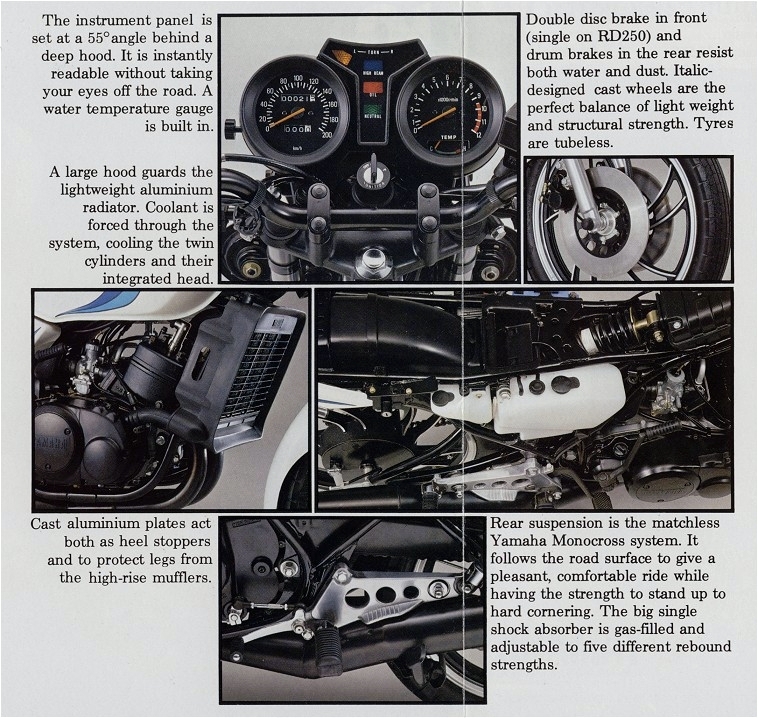 The second pics is a YAMAHA publicity extracted from an English magazine from september 1979. 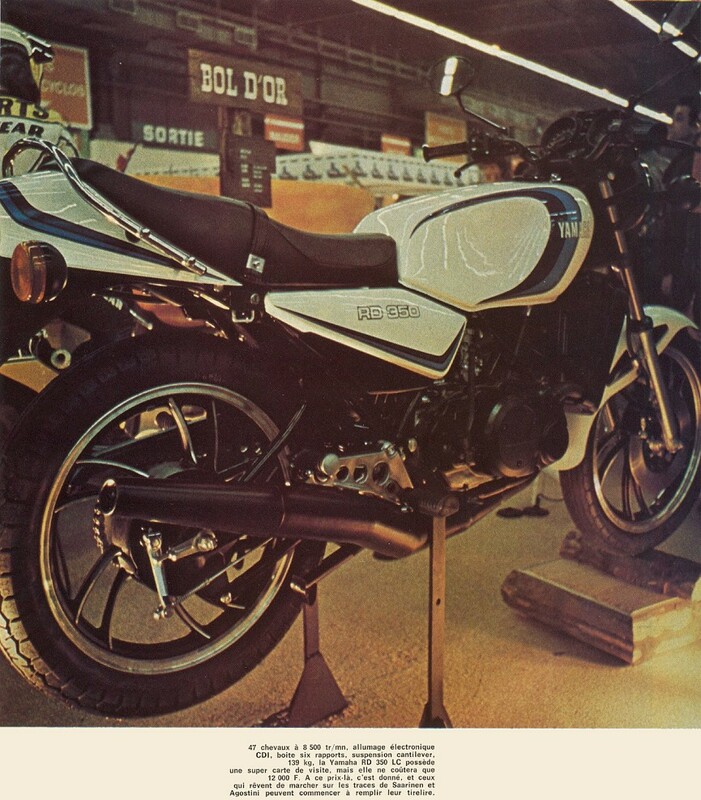 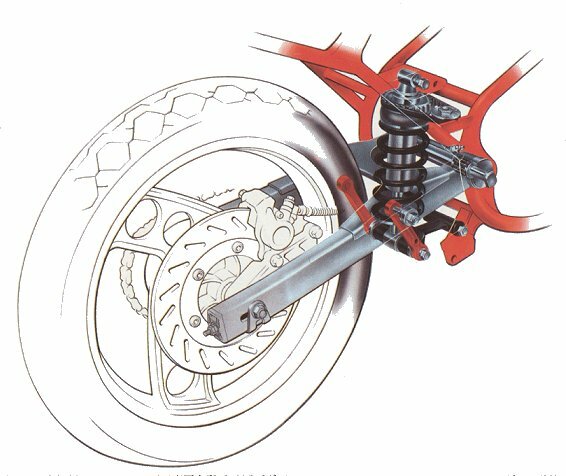 October 1979: First presentation @ Paris bike show (with only 1 front brake disk). 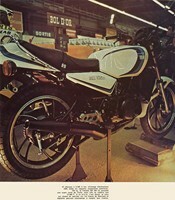 June 1980: Beginning of sale (with 2 front brake disks). 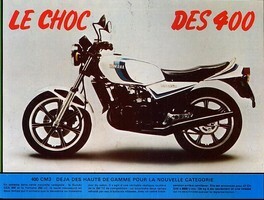 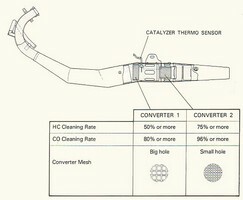 Model sold in Europe. 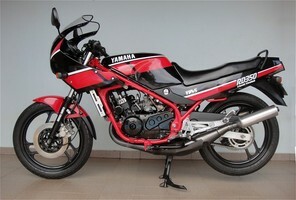 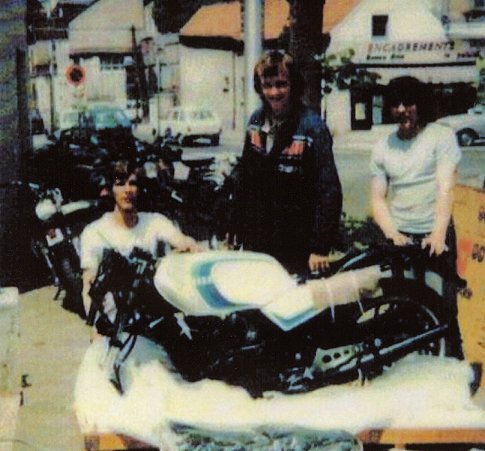 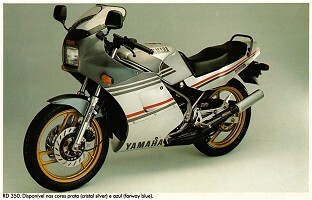 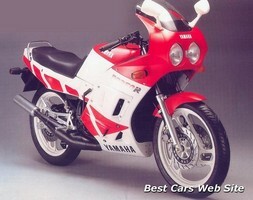 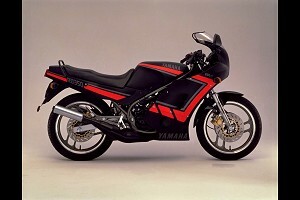 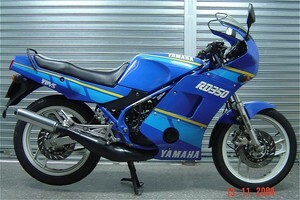 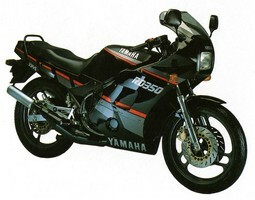 Here is a dream pics: you are in June '80 and you arrive to your Yamaha dealer wich just get your bike !!! 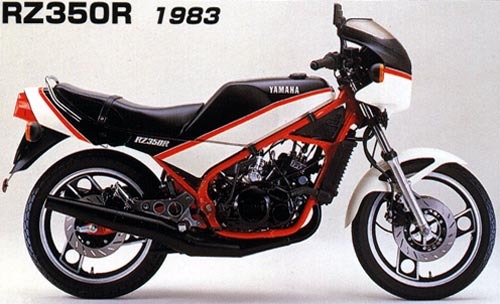 1982: New coloring for Europe/Australia/Japan. 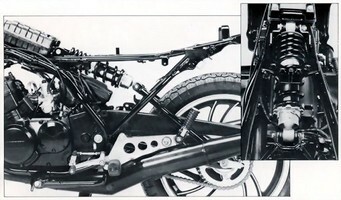 1983: New model and coloring (with only a little number of common parts with the old LC) with new YPVS engine with thermostat, new exhaust (bigger volume), new frame, new front fork air assisted, new rear suspension monocross (instead of cantilever), new swinging arm, new slotted triple disc brake (with rear disk instead of drum), new wheels with tubeless tires, new fuel reservoir, new seat, new handlebars, new footrest bracket, new instrument console, new lateral cover & bikini fairing, new front fender, new front light . Different coloring for Europe and for Canada/Australia/Japan . 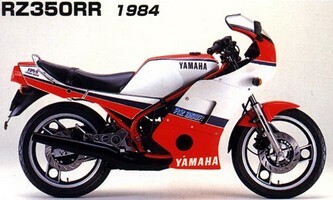 1984: New catalysed model for USA only with Kenny ROBERTS replica coloring. Other new different colorings for Europe/Australia , other coloring for Canada and new model with integral fairing for Japan (1 year earlier than the rest of the world...). 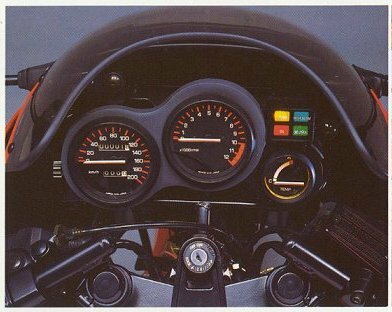 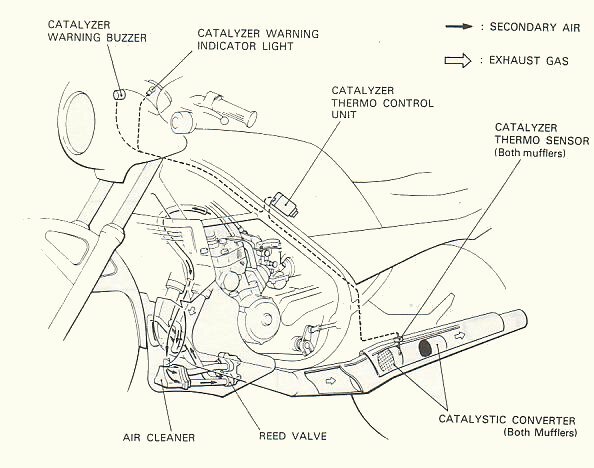 1985: New models and coloring (one with integral fairing) with new instrument console with electronic RPM tachometer , new swingarm, new pipes, new front fork, new brake calipers with opposed pistons, new fender, new front light, new indicators. 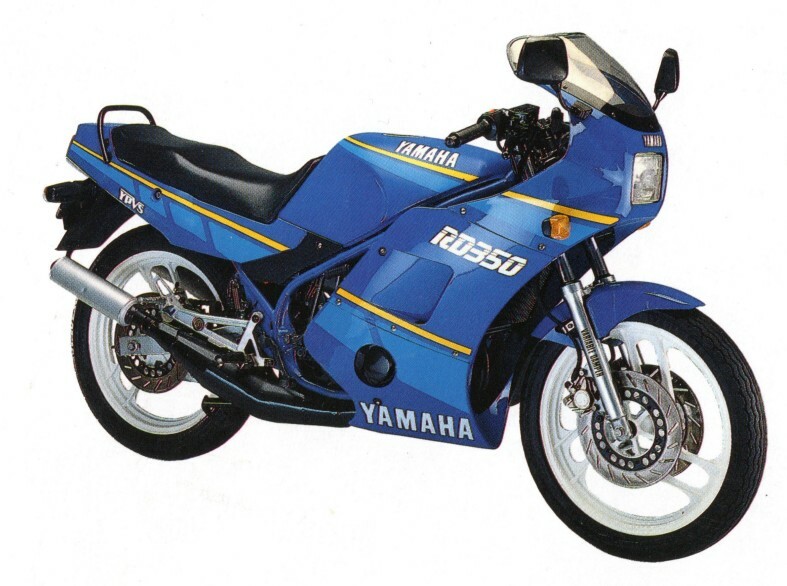 Different coloring of faired model for Europe/Canada and for Australia . 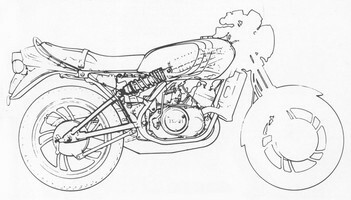 Coloring for naked model for Europe . New coloring but from the '84 model for USA (without the above improvement). 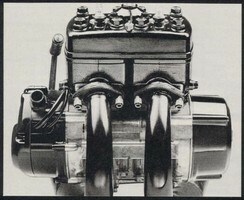 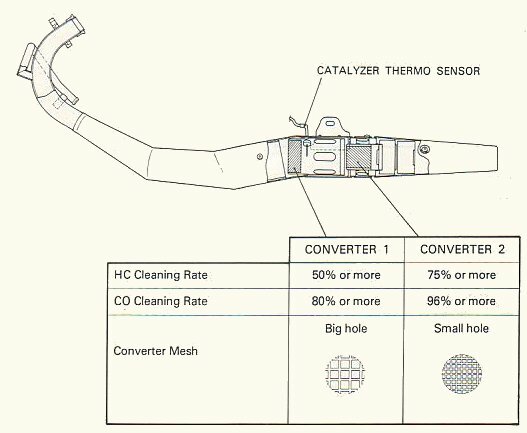 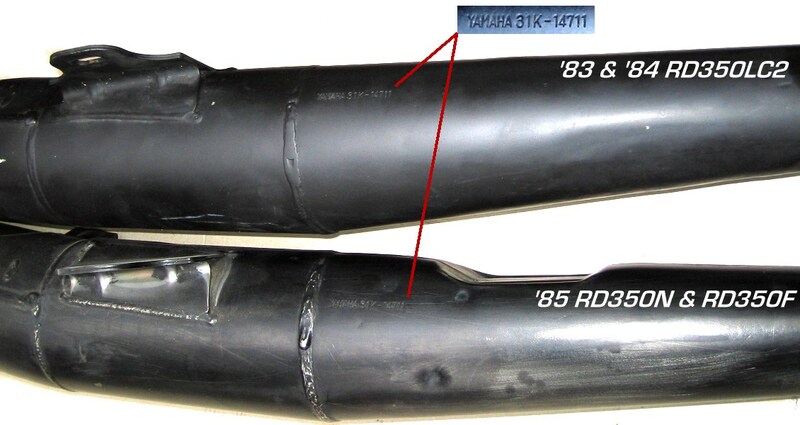 1986: New models and coloring (one with fairing), with new frame, new fuel reservoir (air craft style) , new carbs (with additionnal power jets), new pistons, cylinders, cylinder head ( YAMAHA mount some old 31K cylinder head instead the new one ), new ignition & YPVS settings, new exhausts, new lateral cover, new indicators, new footrest bracket and to save weight: new battery, new disk brake, new wheels. 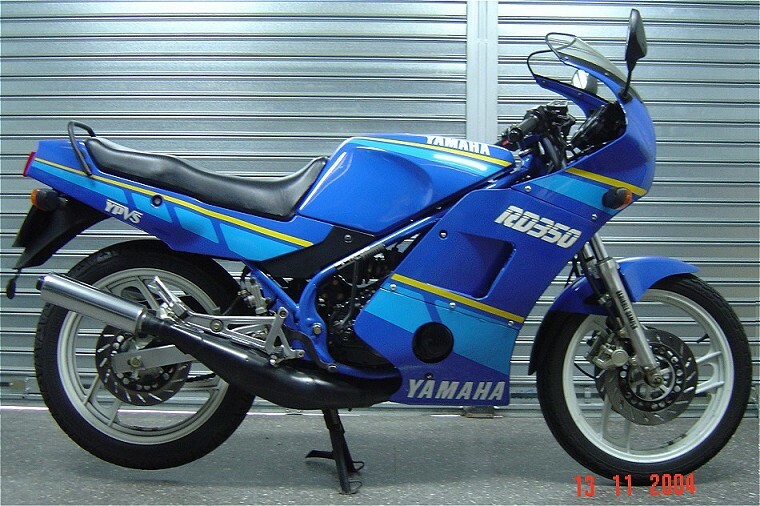 Different coloring of faired model for Europe/Canada/Australia and for Brazil . 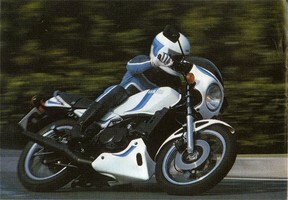 Coloring for naked model in UK/Germany/Denmark('88). 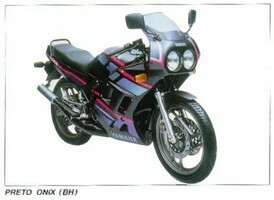 1987: New colorings with bike made in BRAZIL (to MANAUS by YAMAHA MOTOR DA AMAZONIA) for Italy/Spain/Brazil('88). 1988: New colorings for Europe (the blue/yellow for '90 in Canada). 1989: New colorings for Brazil. 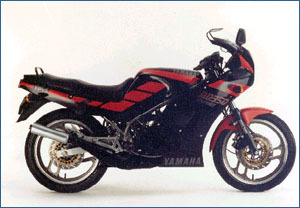 1990: New different colorings of faired model for Spain and Brazil. 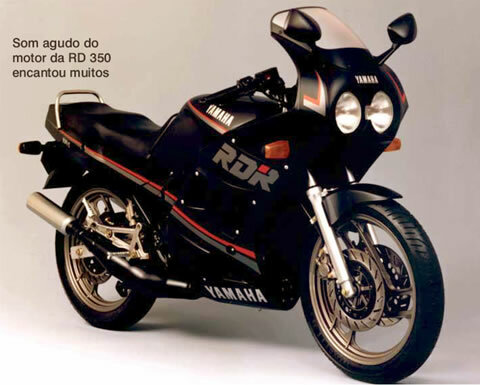 1991: New model for Brazil with new full fairing with twin head lamps. 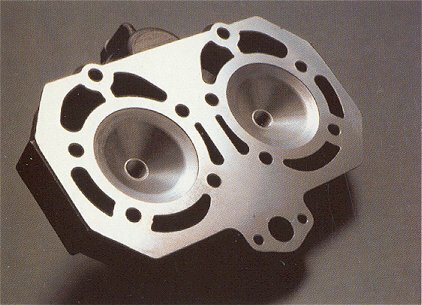 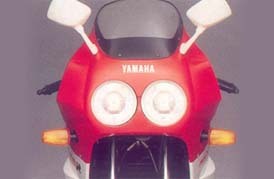 1992: New model with twin head lamps models for UK/Italy/Spain and Brazil. 1994: New coloring for UK. 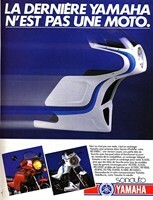 1995: End of sale in the world in UK with the Brazilian twin head lamps model.